Graduating from dental or trade school is a big achievement, so mark the occasion with personalized dental gifts. The best gifts for dentists come from the heart; consider the recipient's favorite parts of the job. From toothbrushes to syringes, our selection of dental-themed jewelry has you covered. The watch is a classic thank you gift for dentist professionals. These watches have tools, teeth and other meticulous details that dazzle the eyes of any dental fan. 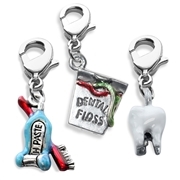 Charms are also a nice touch, especially if the dentist has an established collection. Buy the entire charm bracelet or just the handmade charms. If you’re a dentist shopping for unique accessories for yourself, we have what you need! Don't forget to start conversations with your future patients by wearing eye-opening earrings in the shapes of teeth.